It's time to have a look at the pinout of the LCD..... Most of the lcd's have a common 16-pinout connector. But some of them (very rare these days) have a 14-pinout connector, and that's because they don't have backlight illumanation. These pinout connections are placed either in 2 rows of 8 pins (Fig3) or a single row of 16 pins. (Fig2) Which is also and the most common. Right now we will see each pin individually and analyze each role of it. (Fig2) The 16-Pinout in a single row. (Fig3) The 16-Pinout in 2 rows of 8 pins. 1 (VSS) Is the ground and usually by default the first pin of the lcd. 2 (VDD) Is the positive supply of the lcd. Datasheet specifies that a 5vdc supply is the nominal voltage of the lcd, but 6v and 4.5v supplies are acceptable. It has been noticed that for some display modules, 3v can make them work just fine. 3 (VO) Is the contrast of the lcd. for the lcd that needs to be adjusted. 4 (RS) Is the register select pin. This pin is used to select whether data or command is being transferred to the lcd. If this pin is high then data can be transferred FROM or TO the lcd at the current lcd cursor position. 5 (R/W) Is the read / write pin. When this pin is low, you can write commands or character data to lcd. When this pin is high, you can read character data and status information from lcd's registers. For most applications there is no reason to read from lcd. "Busy flag" can be polled to determine when the last instruction that has been sent, has been completed processing. 6 (E) Is the enable pin. in 8-bit transfer mode, or in 4-bit (D4 to D7) data lines if the module has been initialized to 4-bit transfer mode. data will be readable shortly after the low to high transition, and remain readable until the signal falls low again. 7-14 (D0-D7) Are the eight data bus lines. Data can be transfered to or from the display either as a single 8-bit byte or as two 4-bit nibbles. If 4-bit mode is used only the upper 4 data lines (D4 to D7) are used, leaving the other 4 data lines (D0 to D3) floating. When using 4-bit mode, it has a positive advantage that you can save pins from a microcontroller. But if speed is required then 8-bit function is advisable. 15-16 (LED) Is the backlight illumination. These two pins are the anode and the cathode of the led(s), that are placed behind the lcd panel for its illumination. Usually pin15 is the anode of the led(s) (+), and pin16 is the cathode of the led(s) (-). (Fig9) Black cubes printed on the lcd. When you first power the lcd module, you may notice black cubes printed on lcd screen (Fig9). (if the lcd has a 4 row display panel).This is mentioned because in that state lcd must be initialized. 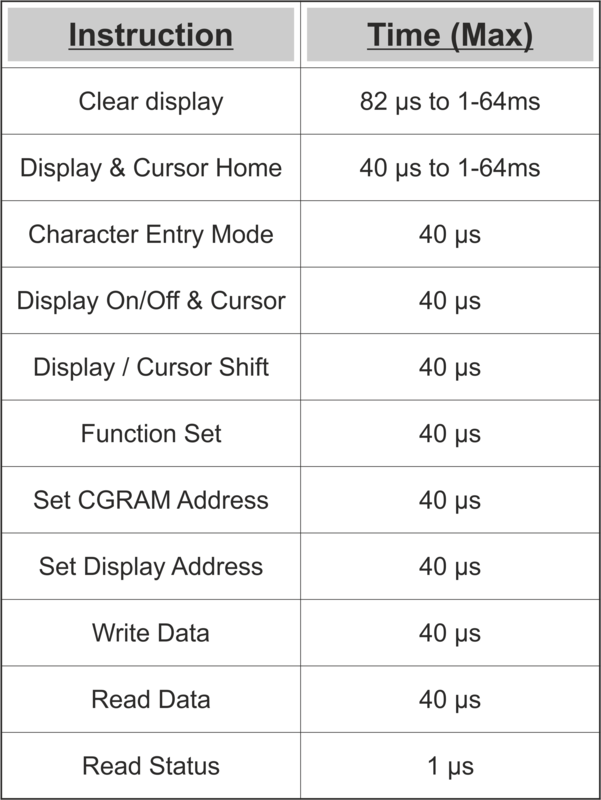 From the timing chart as we will see furthermore, we must provide to the lcd a delay of 15ms (least...i would recommend 50ms or more) before initialization procedure. That delay is crusial because VCC has to reach the nomimal voltage of 5V, so that the lcd would be able to accept commands. Sending commands before this period will result of initialization failure. Before we move on initialization we must analyze few things... let's begin with lcd's command set. All and all there are only 8 commands to mnemonize.Prettty easy! As you can see from above, each command has configurable bits where you can set your lcd accordingly your needs. Next is timings. We must understand the timings that these modules have, in order to accept commands properly. So what are all these diagrams and tables about? Fig13 provides information for read and write cycles. In other words Fig13 showing us how quickly the lcd can respond, so that we can program our mcu accordingly. Fig12 are the timing parameters to Fig13. What really matters is that all these signals must be stable for a minimum or a maximum period of time. For example lines RS and R/W must be stable for a minimum period of time before level logic on the 'E' line is raised to a logic 1. 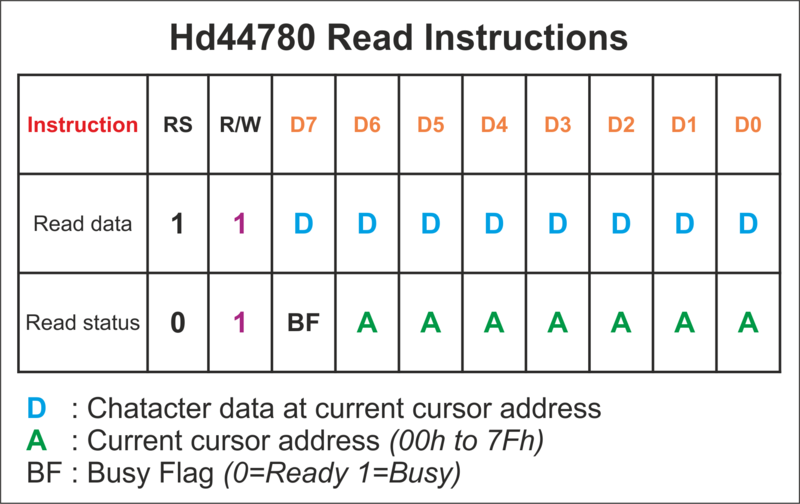 This is named on the diagram as 'tAS' (time-address set up) and it is specified as 140ns minimum. It can be more but not less!!!. Once the 'E' line is high it must not be brought low until 450ns has elapsed. This is named as 'tEH' (time - enable high). 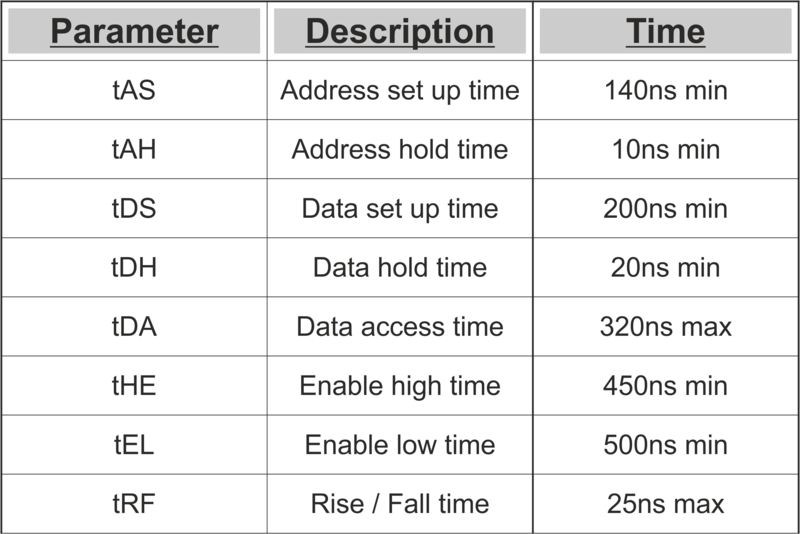 the 'tDH' (time - data hold) which reffers to the data lines that must not be changed for at least 20ns. Finally line 'E' must not be brought back high again until the period of 'tEL' (time - enable low) has reached 500ns. So 'E' line has a 'reserved' time of 950ns (high-low) plus the rise and fall time 'tRF' which must not be longer than 25ns. This is translated as no more than one million commands or one million characters per second should be sent to lcd. Having all that said, you may remember from before that these lcd's can be controlled either in 8-bit or in 4-bit bus mode. 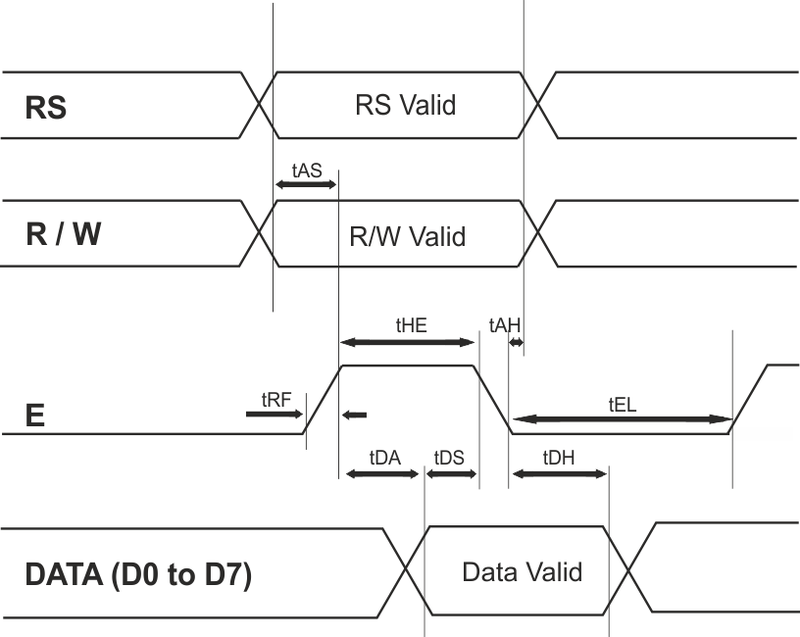 The following chart shows the proper initialazation taken by hitachi's datasheet in both bus modes. 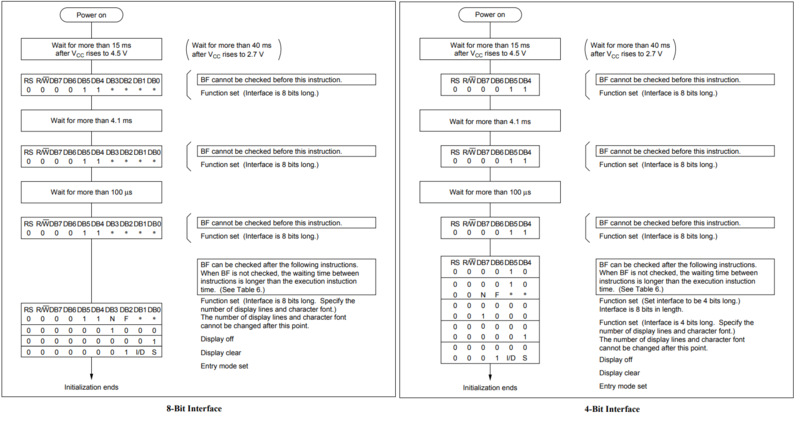 (Fig14) 8-bit, 4-bit initialization procedure. but instead of sending nibbles to the lcd you send the whole byte. So some may ask what is a nibble? In computing nibble is an expression that refers to a half byte or to a quarter byte. 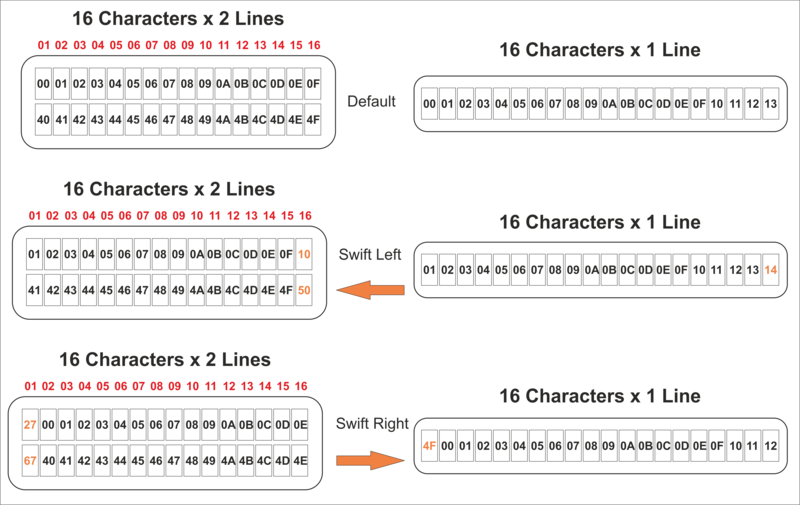 One 8-bit byte consists of two nibbles. The upper four bits (bit7 to bit4) also known as MSB (Most Significant Bits) and the lower four bits (bit3 to bit0) also known as LSB (Least Significant Bits). The transmition priority for the nibbles in these lcd's is that in the first cycle you send the upper four following by the lower four on the following cycle. The first command that we come across the initialization chart is the function set. Bit5 to bit7 must be left as it is in the command above, since this is the default setting to this command. and after that you resend the same command having cleared bit4 to establish a 4bit bus mode. the configurable bits to select the functions of the lcd as we have discussed above. 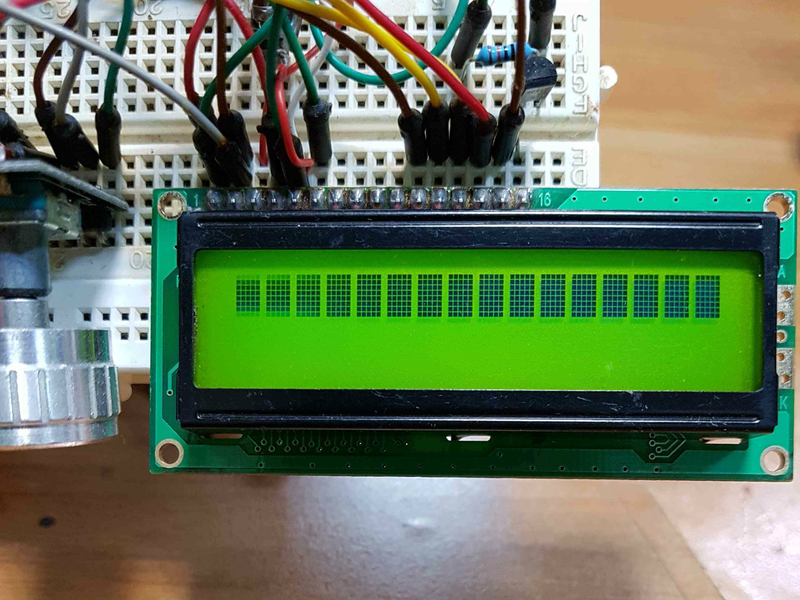 Display On / Off and Cursor. The following command in the initialization chart is the display On/Off and cursor. Bit3 to bit7 must be left as it is in the command above, since this is the default setting to this command. One command before initialization ends, is the clear display. In this command there are no configurable bits. You send it as it is by default. This command clears the display (actually writes white spaces to all screen) and places the cursor to the first position of the lcd which is 0. Also returns the display to its original state if it was shifted. in that initialization order by accident. After this command in the initialization chart comes the entry mode set. increase, the clear	display command will return the lcd to increase, since that is the default setting. So beware when using and where placing this command. And finally the last command on initialization chart is the character entry mode set. Setting bit1 will select lcd's address counter to increase. There is not much to say for this command just it places the cursor home to position 0 of lcd, without clearing it's contents. Also returns the display to it's original state if it was shifted. As it is obvious in this command there are no configurable bits. This command sets the address counter to write, in a specific location in the custom graphics ram (CGRAM), which is from 40h to 7Fh. Bit0 to bit5 are the configurable bits for this command, where you tell the address counter to go and write in the specific address. Bit6 and bit7 must be left as it is in the command above, since this is the default setting to this command. Further analysis it can be found below on CGRAM chapter, where i explain how to read, write, and create custom graphics. This command places the cursor to a selected address set by you, to print the character you want in that location. The range for the address counter is from 80h to FFh. and also to print the desired character. Bit7 must be left as it is in the command above, since this is the default setting to this command. (increnment or decrement on 'Character Entry Mode Set' command). And the second one is that you can control the direction when shifting the display, or moving the cursor to be left or right. (When it is enabled). Bit4 to bit7 must be left as it is in the command above, since this is the default setting to this command. Shifting the display is a nice feature, because you can easily make scrolling messages that may look awesome to your projects. I will make a brief analysis below of how you can swift the display. This is an interesting question that it's answer comes back with a counterquestion.... Are you in a hurry? Actually there is only one way where you can check whether the lcd has finished processing the command or the data you have sent to it. This is accomplished using Polling method. Polling method, is a method that keeps checking lcs'd status register bit BF (Busy Flag) until it is cleared. needs to be processed, as (Fig11) above illustrates. Both methods have advantages and disadvantages that we will discuss later on. depending the state of the RS pin. leaving the remaining bit7 for the busy flag. damage to microcontroller may occur to its output pins. So after that when 'tAS' (address set up) has elapsed, E line can be taken high. 320ns (Data access time 'tDA'). After that you can read the data and return pin E to low state. Firstly the additional code that in some cases you are limited by microcontroller's memory. The minus extra pin that it will be reserved for the R/W pin. And finally the risk of lcd's hardware failure, that will occur microcontroller to stuck. You can swift the display in both directions (left or right) but with a disadvantage. The lcd moves all of its contents simultaneously in all lines. Now... each time you send this command then the display or the cursor shifts left or right according to your settings. I have made two examples in order to understand how swifting is working on lcd's..
One for 16x2 display and one for 16x1. It is now clearly how the display rolls over at the beginning. (Fig21) Swifting Display Left / Right.